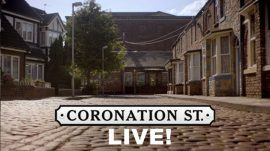 Coronation Street was broadcasting a live episode to celebrate 60 years of ITV. The digital team wanted to offer the fans a unique experience to see behind the scenes and to be able to interact via social media with the production. The audience was going to be very large so Groovy Gecko had to ensure that the video stream could be delivered effectively to tens of thousands of viewers live as well as enable the digital team to manage questions coming from the audience as part of the interactive sections of the webcast. Groovy Gecko used its unique social streaming platform to deliver the live show into a News Feed post on Facebook so that viewers could share it with friends and comment on the post to send questions to the presenter. The question moderation system allowed the team to sort through in bound questions from both Facebook and Twitter and send them through to the presenter’s iPad. As always there were multiple redundancies in the workflows so that we were able to deliver the live content to a large audience seamlessly. The live stream for the episode was the highest ever non-boosted Facebook live stream in Europe giving many thousands of users a unique interactive second screen. The average viewing time was very strong at over 26 minutes.